Our friendly sales and customer service staff combine extensive experience with today’s state-of-the-art technology to provide you with the ultimate recycled auto part buying experience. This along with our six-month exchange warranty has cemented our place in the salvage auto parts industry. If you’re repairing, rebuilding or restoring your vehicle, look no further than Glendale Auto Parts. Search our extensive inventory today by clicking here or by contacting us at (623) 939-5800 or (877) 616-7181. Recycled parts are good for the environment, good for your vehicle, and good for your wallet. Buying recycled parts may be your best option. Especially if you have a classic car in need of parts that may no longer be available. 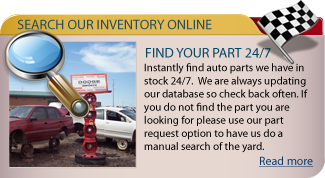 Our large inventory allows for rare and hard to find parts. All engines and transmissions are tested, inspected, and stored in our warehouse to ensure you receive the highest quality. All automotive parts are offered at a fraction of the cost compared to a new part. 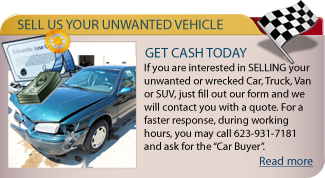 Contribute to a cleaner tomorrow and receive top dollar for your unwanted or salvaged vehicle by selling it to us. Glendale Auto Parts will buy your used car, truck, SUV or motorcycle in any condition, whether it’s running or non-running. Our process is simple and straightforward! A legal title is required in order for Glendale Auto Parts to purchase the vehicle. If you would like more information on this service, contact us. How to Buy Parts from Glendale Auto Parts? 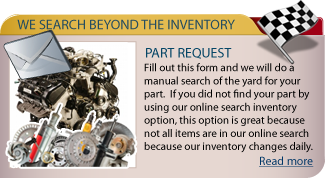 Search our inventory to locate your part. Contact us with the part number and vehicle information by completing the online form or calling us at (623) 939-5800 or (877) 616-7181. Our friendly sales staff will verify that the part you have chosen is compatible with your year, make, and model vehicle. Our sales staff will then add that part to the online catalog for you to purchase through PayPal. Once we have confirmation that you purchased the part, our shipping department will ship the part to you, or you can come pick it up at our Glendale location. You can also visit us at 6430 W. Orangewood Avenue, Glendale, AZ 85301. We are open Monday – Friday from 8:00 AM to 5:00 PM as well as open the 2nd and 3rd Saturday of every month from 8:00 AM to 2:00 PM. Closed Sundays. We accept all major credit cards, debit cards, and cash.